NYU wins variance for six story building on Wash. Sq. 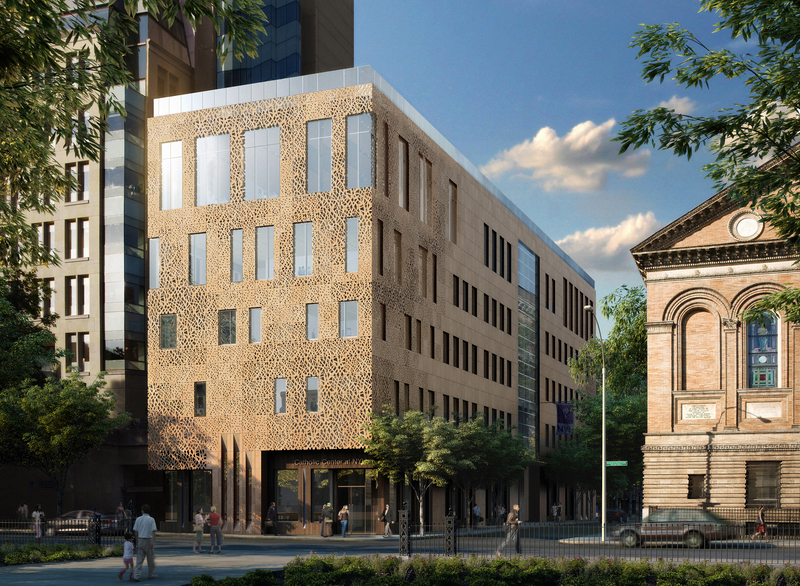 NYU’s proposed Center for Academic and Spiritual Life at 58 Washington Square South. Image: Courtesy of Machado and Silvetti Associates. NYU claimed that academic center required taller street wall and larger floor plates in order to integrate with neighboring Kimmel Center. New York University applied to BSA for a variance to construct a six-story building, to be called the Center for Academic and Spiritual Life, at 58 Washington Square South in Manhattan. The 12,650 sq.ft. project site is part of a 36,205 sq.ft. zoning lot that includes NYU’s eleven-story Kimmel Center for University Life. The project site was formerly occupied by the Catholic Center of NYU’s Holy Trinity Chapel, which the Archdiocese of New York demolished before selling the land to NYU in May 2009. NYU’s plan calls for an 88-foot building with no setbacks that would connect to the Kimmel Center on the second through fifth floors, allowing NYU to integrate the Kimmel Center’s food service and kitchen space with the new building. The building would house a new Catholic Center at NYU in the first floor and provide space for twenty classrooms accommodating 25 to 125 persons each and acoustically-isolated music rooms. NYU needed a variance because the design violates the area’s R7-2 zoning regulations, including requiring a twenty-foot setback after reaching a maximum street wall height of 60 feet or six stories, whichever is less. but argued that the taller and narrower design would not allow the larger floor plates necessary for the required classroom space. It also argued that the increased number of floors would prevent an efficient circulation of students and staff within the building and between the Kimmel Center and the building. Preservation groups and residents opposed the application. Manhattan Community Board 2 recommended disapproval, stating that it was not satisfied with the building’s aesthetics. The Greenwich Village Society for Historic Preservation argued that NYU did not establish its programmatic needs. The group also cited concerns about the building’s overall scale and the potential effects of shadows on the nearby Judson Memorial Church. BSA granted the variance, pointing out that NYU’s massing studies indicated that the proposed rectangular design without setbacks would be more in character with nearby buildings than a building with the required setbacks. BSA added that NYU’s environmental assessment concluded that the building would cast less shadow on Washington Square Park and the church than a complying alternative. Noting the opposition’s concerns about the building’s architectural details, BSA stated that such concerns were outside the scope of the variance.